Last night we enjoyed watching the legendary Gary Numan perform to a packed out Royal Albert Hall, complete with a spectacular light show and the incredible Skaparis Orchestra accompanying him. 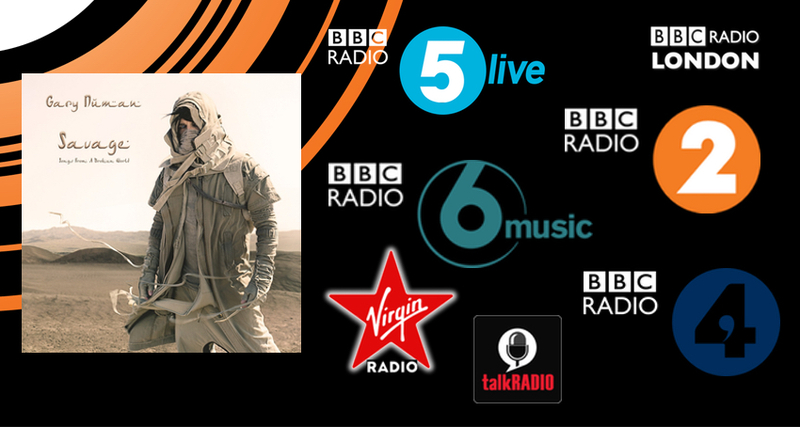 This show was the finale to the ‘Savage’ album campaign, so we thought we’d take this moment to round up all the promo we’ve had throughout Numan’s number 2, highest charting album since 1981. 1500+ plays across stations including BBC Radio 6 Music, BBC Radio 2, BBC Radio 4, Virgin Radio, BBC Radio Wales, BBC Radio Scotland, BBC Radio London, BBC World Service and talkRADIO. 3 playlist additions on 6 Music with all singles receiving a world exclusive. BBC Radio 2: Steve Wright in the Afternoon, Simon Mayo Drivetime, The Arts Show with Jonathan Ross and Zoe Ball. BBC Radio 6 Music: Radcliffe & Maconie, Steve Lamacq, Marc Riley, Liz Kershaw and Matt Everitt. BBC Radio 4’s Loose Ends. BBC Radio 5 Live’s Afternoon Addition. BBC London with Robert Elms. Virgin Radio with Eddy Temple Morris. Album of the Day on 6 Music. Record of the Week on Virgin Radio. Long Walks with Janice Long on BBC Radio 2. BBC Radio 2 Breakfast/On This Day feature. Multiple features on 6 Music’s Roundtable with Steve Lamacq. Extended Hometown Glory feature with Chris Hawkins on 6 Music. My London feature on BBC Radio London with Gary Crowley. Thanks to Gary Numan and BMG for having us on board for this campaign – it’s been a great one!